Volunteering runs in my family. My grandmother was a professional volunteer. 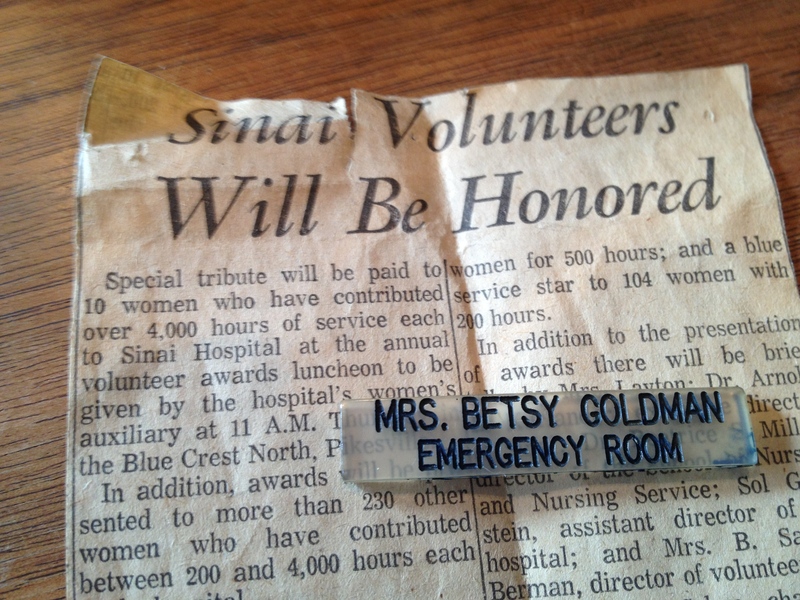 By 1963, she had given more than 10,000 hours to Sinai Hospital. They gave her a gold star pin and a diamond to commemorate her. Later, I remember a silver bowl she was awarded. But I know – for sure – that my grandmother did not volunteer all those hours for recognition. She loved her “job” and took it very seriously. My mother has volunteered ever since I can remember. She has served Mildred Mindell Cancer Foundation in virtually every capacity – including President. She’s always been active in something. And I’ve always admired it. What stands out for me the most is that, when I was in first grade, my mother was chair of June Jubilee at our elementary school. And she ran the silhouettes booth (I think my Aunt Phyl helped at the booth?). I remember how hard she worked. But mostly, I remember being so proud. MY mother made the most fun day of the school year amazing. And she bought me a Lemon Peppermint Stick – one of my favorite and stickiest treats. Well, I suppose I am genetically predisposed to volunteering. I do my part in several organizations. I’ve worked hard. Mostly, I’ve found it tremendously rewarding. No recognition necessary. But even though I’m a little shy about what I do, I would love to help my organizations get recognition. Who wouldn’t, right? Cabot Creamery Cooperative (disclosure: this fab 1200 farm family owned coop is a client of mine) is sponsoring a new iPhone app – RewardVolunteers, that does that. You can log your hours for your organization for the chance to win cash and prizes for you and the organization. And think of the publicity. And how cool it would be to show how engaged the volunteer base is? Nana G had given over 35,000 hours of her time and love to Sinai Hospital. She was loved by all the people who’s lives she touched, just like you.